With the growth of the printing press, there was a decline in hand written and illuminated manuscripts. However, a revival in beautifully, handwritten text became apparant again at the end of teh 19th century. Edward Johnston, is the founder of modern calligraphy and was very much influenced by the Art and Crafts movement that was taking place at that time. He is thought to have single-handedly brought back the art of calligraphy through his books and teachings on the subject. Johnston’s influence was particularly strong with his students who in turn established the The Society of Scribes and Illuminators in 1921. This organization is still active today and is the world’s foremost calligraphy society specializing in the promotion and development of the craft through exhibitions and lectures. In certain cultures, calligraphy is as much adored and respected as paintings. It combines the formation of characters to show rhythm, proportion and creativity. Today, I can truly say Calligraphy is an art form. Watch this wonderful video of artist Bernard Maisner at work to see what I mean. With the rise of tech, it often seems that hand lettering and calligraphy may become a thing of the past. I know that in some schools they no longer practice “script” writing. Do you remember practicing on lined sheets on how to properly connect letters, all while adding your own bit of style and flair to it? I certainly do. Adding a bit of Calligraphy to an already wonderful event just makes it that much more so. I thrill every time I see a special envelope arriving in my mail box. Because I know what is inside is exactly that “special!” I personally love the idea of everything hand crafted and truly appreciate the thought and time that goes into it all. However, in this day and age, we can have the best of both. Therefore, I have compiled both a list of outstanding hand calligraphers, as well as some beautiful digital fonts mimicking the beautiful artistry of hand lettering. 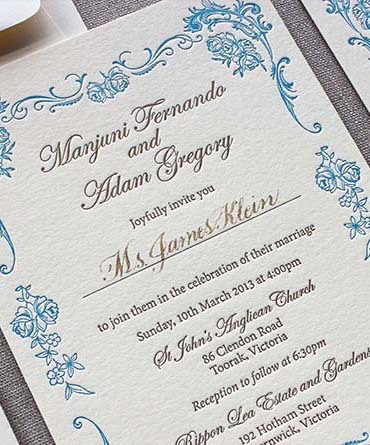 Invitation text and Envelope Return addresses can be designed with stunning hand lettering, calligraphy, serif and sans serif fonts or an interesting combination of both. If you truly love the idea of hand calligraphy, an artist can be commissioned to write certain words or phrases which can then be scanned, made print ready and incorporated into the design. 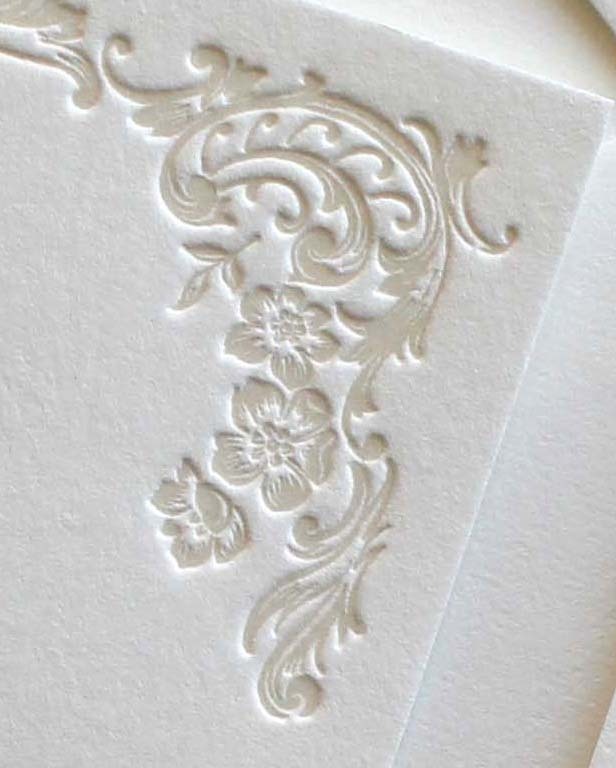 Little Dove Design has also created invitations which incorporate a line in which the calligrapher can further personalize each invitation with the guest(s) name. See the photo above for a great example of this. Here is a list of of my favorite digital calligraphy fonts, as well as some truly gifted hand calligraphers and their websites. • Moya at http://mminkstudio.com. Her artistry is truly beautiful. • meant to be calligraphy has some lovely styles to choose from. • Laura Hooper at http://lhcalligraphy.com offers a wide assortment of gift items featuring her beautiful calligraphy as well as calligraphy services. • Grace Edmonds at graceedmands.com. She offers a styles with delicate swashes and embellishments. 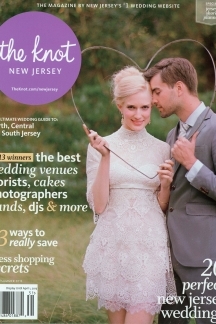 What is letterpress printing? This is a question I get asked a lot. Many people want to know exactly how this process works and what is involved. Let’s first learn about the history of this art form. Letterpress printing was started in the mid-fifteenth century by a German goldsmith named Johannes Gutenberg. In 1439, his invention of moveable type started the Printing Revolution. This allowed for mass communication in Renaissance Europe. Before this, book production in Europe was a handwritten manuscript. In 1455, Gutenberg printed one of his most famous works — 180 copies of his 42-line bible known as the Gutenberg Bible. At the time, a copy of this bible could be obtained by the wages an average clerk would earn over the course of three years. Today, 48 copies are known to have survived, two of which are housed in the British Library. The pages of both the paper and vellum scripts can be viewed here. The process itself is very laborious. Setting the type for each page may have taken half a day and Gutenbergs shop is thought to have employed 25 craftsmen to help in this task. Today, Johannes Gutenberg is considered one of the most influential people in human history and Time-Life magazine regards his invention as the most important of the second millennium. Moveable type is where letters and type forms were cast or hand carved and then set by hand onto a frame or “chase”. The “chase” is then locked into the bed of the printing press. The type forms are inked and paper is sandwiched between the bed holding the text and the “platen” above. In Gutenberg’s time, this flat plate known as the “platen” was wood. Today, it is made of metal. The pressure applied when closing the press, produces a relief print onto the page. Essentially, the ink is pressed down into the paper producing a tactile, deboss which can be seen and felt. The finished print is very much prized because of its beautiful definition of type and artwork. Currently, a very small amount of these letterpresses remain. With the ease and popularity of “offset” or flat printing in the 20th century, many of these presses were left by the wayside. Presses that are found, need to be lovingly restored by expert craftsman. We are fortunate to now be able to use these select vintage presses for upscale stationery items and wedding invitation suites. Lovers of the “craft” appreciate that papers often need to be fed into the printing press — by hand, one at a time. Unlike, “offset” printing, which can produce multiple colors at once, letterpress can only print one color at a time. The process requires a great amount of skill and high degree of craftsmanship by the press operator. The visual beauty and texture of this printing process has spurred a rise in high-end ephemera such as wedding invitations and greeting cards. 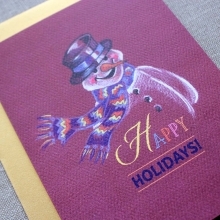 Many couples and collectors value the finish and quality of letterpress — something that can not often be found in more modern techniques. These precious items hark back to a bygone era.